Prepare to be wowed. Spend two Days on our Arctic Crawler tundra vehicles in search of the majestic polar bear. Your experienced guide will take you to polar bear hot spots with stops along the way at wilderness areas known for arctic fox, arctic hare and snowy owls. Each night you will return to the Lazy Bear Lodge for good food and a good night&apos;s sleep. Arrive in Winnipeg and check into the Hilton Suites. Breakfast and then morning free time in Winnipeg. Afternoon flight to Churchill and check into Lazy Bear Lodge. Sign up at the front desk for Aurora Borealis viewing - you will be notified if the weather conditions allow for viewing. After breakfast, first full Day tour on the Arctic Crawler tundra vehicle for polar bear viewing. Lunch provided on board. Following breakfast, morning tour of cultural and heritage sites in Churchill and area. Afternoon free time to visit the Canada Parks Visitor centre, the Eskimo Museum or for shopping. Evening dog mushing tour, including photo opportunities. Tea and bannock served. Breakfast followed by second Day on the tundra for polar bear viewing. Evening flight to Winnipeg. Overnight at Hilton Suites. 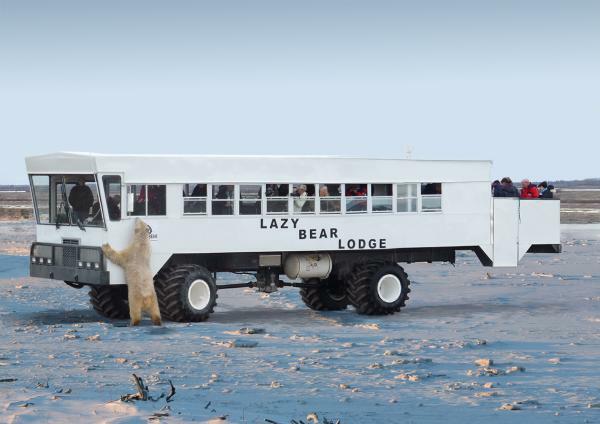 For detailed itinerary, plus tour inclusions and exclusions, please visit Lazy Bear Lodge.